Superbook teaches children timeless moral truths and life lessons through the captivating, Bible-based adventures of two time-traveling children and their robot friend. View Series Overview. 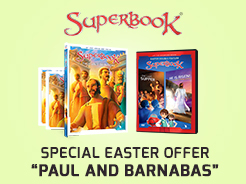 Join the Superbook Club now and get 3 DVDs of "Paul and Barnabas," plus the Easter Double Feature with 2 full-length Easter episodes! Superbook Club members can now stream Seasons 1—3 on 3 separate devices. Find out more! The Superbook Kids Bible App is a media-rich experience that brings the Bible to life for kids with videos, interactive games, Biblical answers to their questions, and more. Watch the Bible come alive with the children's ministry curriculum from Superbook. Get your exclusive Superbook characters. © The Christian Broadcasting Network, Inc. CBN is a non-profit 501 (c)(3) charitable organization. Superbook® is a registered trademark of The Christian Broadcasting Network, Inc. All Rights Reserved.